The Vaccine Controversy, The Movie; a film by Richard P. Milner, Public Affairs Media, Inc. This virtual debate presents two opposing views of the safety and efficacy of vaccines. The film is a pilot for a larger project to educate the public about the vaccine controversy. Biochemist and pharmacy professor Dr. Boyd Haley disputes the claims of vaccine inventor/spokesperson Dr. Paul Offit point by point. Dr. Offit says vaccines are safe and effective. Dr. Haley says they are not. DR. OFFIT ARGUES THAT VACCINES ARE ALL THAT STAND BETWEEN US AND A PLAGUE OF INFECTIOUS DISEASES; THAT WHILE ADMITTEDLY, A FEW OF US ARE INJURED BY VACCINES; THE VAST MAJORITY ARE PROTECTED BY THEM. DR. HALEY ARGUES THAT VACCINES ARE NOT VERY EFFECTIVE AT ALL. AND THAT OUR CHILDHOOD VACCINE PROGRAM HAS BEEN RESPONSIBLE FOR DISABLING AN ENTIRE GENERATION OF CHILDREN. Dr. Paul Offit, MD, a vaccine inventor, is the Maurice R. Hilleman Professor of Vaccinology and Professor of Pediatrics at the University of Pennsylvania, a chair funded by Merck. He serves on the CDC committee that recommends vaccines for the US Mandatory Childhood Vaccination Schedule. For detailed biography, go to www.publicaffairsmediainc.blogspot.com. Dr. Boyd Haley, Ph.D. is Emeritus Professor and Chair of the Chemistry/ Biochemistry Department at the University of Kentucky Markey Cancer Center. His testimony before Congressional and government committees and the Institute of Medicine has resulted in legislation in several states to remove Thimerosal and mercury from dental and vaccine products. Dr. Offit and Dr. Haley were interviewed separately and edited together. The total project will include a series of virtual debates among experts, culminating in a full-length film airing all sides of the vaccine controversy. To donate to Public Affairs Media, Inc., for the continuation of this project, go to www.publicaffairsmediainc.blogspot.com or FACEBOOK PAGE. To contact the producer for more information, go to Facebook: Unsettled: The Vaccine Question, The Movie. MILNER: So as a paediatrician, you wouldn’t deepen your knowledge of molecular biology or the brain or other things like that. That would be referred out to another specialist. For example, if you saw a child with a concussion or you saw a child with some kind of brain injury, you wouldn’t treat that, would you? OFFIT: No, it’s—in other words, what I am director of treatment of infectious diseases here at Children’s Hospital Philadelphia and so what we do here at—in the Infectious Disease division is we see children who are inpatients, who have severe or chronic or persistent or unknown infectious diseases, or we see children as outpatients who generally are referred by pediatricians in the community with an infectious disease that they’re having difficulty handling. HALEY: You know, the real problem with uh–people like Dr. Offit, they have no training in toxicology at all. // Medical doctors do not receive training in toxicology to the extent that would qualify them to comment on whether or not an injection of a certain amount of a toxic chemical like Thimerosal or mercury in the body would be toxic. They’re just not trained to evaluate that. OFFIT: Vaccines are the best of two worlds. What they do is they induce roughly the same immune response that are induced by natural infection without having to pay the price of natural infection. HALEY: That’s just totally not true. // There’s a big difference in the immune response between a natural infection and getting an injection. For example, if you get injected with the measles vaccine, you can get the measles. People do. If you get the measles, if you get it naturally, you’ll never get the measles a second time. OFFIT: So best of both worlds. You get the immune response that will protect you against a subsequent measles challenge, but you don’t have to pay the price of Measles infection, which can be a high price. OFFIT: It’s certainly true, actually, that I you look at diseases like Whooping Cough or even to a lesser extent Diphtheria, you started to see some decline as we got, you know, more san—better sanitation, better hygiene in our country. But you didn’t start to see a dramatic decline and virtual elimination of those diseases until we introduced vaccines. HALEY: I think he’s totally wrong and the–the data shows that he’s not correct in that assumption. We saw the major drops in, uh, death from the many infectious diseases, say starting at 1900 when they start keeping records–1900, 1910–until about 1940, 1950. Those rates of those diseases dropped dramatically before the vaccines were ever introduced, they dropped over 90%. And so the bigger drops were before the vaccines were produced. THIS CHART OF NEW YOUR CITY MORTALITY RATES TRACKS INFECTIOUS DISEASE FROM 1880 TO 1911. IT SHOWS THAT DEATHS FROM DIPHTHERIA, THE BLUE LINE, FELL PRECIPITOUSLY FROM A HIGH OF A HUNDRED AND SEVENTY-FIVE DEATHS PER HUNDRED THOUSAND TO LESS THAN TWENTY-FIVE BY 1911. IT ALSO SHOWS A SIMILAR DROP IN DIPHTHERIA AND CROUP, THE RED LINE, FROM A HIGH OF 260 DEATHS PER HUNDRED THOUSAND TO LESS THAN TWENTY-FIVE BY 1911 WITH A VACCINE FOR EITHER ONE. THIS CHART OF DEATHS FROM PERTUSSIS OR WHOOPING COUGH IS FROM VITAL AND HISTORICAL STATISTICS OF THE UNITED STATES FROM 1900 TO 1968. IT SHOWS A DRAMATIC DECLINE IN DEATHS FROM PERTUSSIS WELL BEFORE THE PERTUSSIS VACCINE CAME INTO WIDESPREAD USE IN THE NINETEEN FORTIES. THE DEATH RATE FALLS FROM AS MANY AS SEVENTEEN PER HUNDRED THOUSAND TO LESS THAN TWO BEFORE THE VACCINE CAME INTO WIDESPREAD USE. THIS CHART OF UNITED STATES MORTALITY RATES SHOWS THAT CONTINUED DEATHS FROM DIPHTHERIA HAD FALLEN BELOW FIFTEEN PER HUNDRED THOUSAND BEFORE THE VACCINE WAS INTRODUCED IN 1920. PERTUSSIS FELL FROM AS MANY AS 16 PER HUNDRED THOUSAND IN 1907 AND AGAIN IN 1919 TO LESS THAN ONE BY 1951. THE VACCINE WAS IN USE FROM THE 1940’S, BUT SIZEABLE DROPS OCCURRED WELL BEFORE IT WAS INTRODUCED. MEASLES, THE GREEN LINE, FELL TO LESS THAN TWO PER HUNDRED THOUSAND IN 1940, A FULL TWENTY-FIVE YEARS BEFORE 1963 WHEN THE VACCINE WAS FIRST INTRODUCED. TYPHOID, THE DARK BLUE LINE AND SCARLET FEVER, THE RED LINE ALSO DECLINED DRAMATICALLY OVER THE SAME PERIOD. WITHOUT A VACCINE. THIS CHART SHOWS THE DECLINE OF ALL FIVE DISEASES EITHER BEFORE A VACCINE OR WITHOUT A VACCINE. HALEY: Well, you know, when you talk about how much money the–the vaccine program costs–costs the American public, we’re spending, uh, billions of dollars on vaccines. And maybe we would better–be better served if we took that billions of dollars and spent it on hygiene. And good food. And maybe the–the availability of antibiotics in certain areas because I think antibiotics and hygiene have done a lot more to, uh, reduce the amount of infectious diseases in this country than have the vaccine program. OFFIT: and so I live in Philadelphia and therefore feel compelled to, you know, to quote Ben Franklin whenever possible. But you know an ounce of prevention is worth a pound of cure. That’s always true. You’d much rather prevent something than to try and have to treat it. HALEY: Well, I agree with that and I’m trying to prevent infant, uh, deaths and sicknesses caused by in–uh–injection of mercury into their bodies. OFFIT: what I would argue, though, is that we can be very proud of vaccines because the kind of catchment systems, safety catchment systems for vaccines like so-called VAERS or Vaccine Safety Data Link, frankly don’t exist for drugs. HALEY: Well, I’m not so sure they, uh, exist effectively, from what I’ve heard, for vaccines either. Less–less than one out of 10 adverse effects are reported. And I would say that if you think the vaccines are, uh, so safe, then explain to me why this country that has the highest vaccine and the earliest vaccine, uh, rate in the world has such a high level of infant mortality. Much higher than those who give much less vaccines and they give them a lot later in the child’s life. OFFIT: I think vaccines are very safe. You know, ultimately use the sort of dichotomy of safe/unsafe. I think more fairly one should say “very safe”. Because vaccines, like anything that induces an effect in the body, can induce a side effect. And certainly vaccines do have side effects. But I think one can argue that their benefits clearly outweigh the risks, and unfortunately the risks are often misunderstood by the public. HALEY: Vaccines should be totally safe. You shouldn’t be injecting anything into a baby that is toxic and known to be toxic, that increases the health risk to that baby. And that’s what we’ve been doing. We’re injecting aluminum and, uh, mercury, ethyl mercury, into these children. And put–and then some of the vaccines, we’ve seen that they have component parts of DNA from pigs and bovine and chickens, etcetera, that are also being injected. That’s not safe to do that. MILNER: Do vaccines cause autism? OFFIT: No. Vaccines don’t cause autism. OFFIT: It doesn’t make sense that they would. Biologically it never made sense that they would. And now we have a wealth of epidemiological studies proving that they didn’t. HALEY: There is–a lot of logic as to why we think Thimerosal or mercury exposure to children caused the autism epidemic. Number one, autism didn’t exist before we started using organic mercury in vaccines and other biological systems. The first cases reported were in 1941 and we started using mercury in vaccines and biologicals in 1933 or approximately there. When the autism epidemic kicked out in the United States, it started in 1988, it went up in every state in the Union: Alaska, Hawaii, California, Florida, Maine, and everything in between. What–there has to been an environmental toxin because we have established there is no genetic cause of autism. It didn’t exist and you don’t have genetics-caused epidemics. You can have a genetic susceptibility to a toxin, introduce a new toxin, and you can cause an epidemic and I think that’s where the autism, uh, thing is. These are genetically susceptible people being exposed to a new toxin. The fact that we think that Thimerosal did that is it went up in all 50 states at the same time, at the same time we started the–CDC-mandated vaccine program. That’s–that’s issue number one. Number two, what would be this toxin if it can’t be, uh, uh, coal-fired power plants or something as unequally distributed around the country, then it has to be something that the child is, uh, exposed to before two years of age. ‘Cause the average age of diagnosis is four and a half years of age. So they have to be exposed quite early in life. The vaccine program fits that. Then you have to say–it has to be something that affects boys more than girls. Well, Thimerosal, there’s no doubt about it. Mercury affects the male species much more than it does the female species. And then number four, you have to look at all the biological effects. Dr. Offit is ignorant of the biochemistry involved in autism if he says mercury or Thimerosal exposure can’t cause that because what we’ve seen and what other people have done in researches as far away as Poland, Germany, Japan, Korea, etcetera. // They have shown that Thimerosal will induce the same biochemical abnormalities as you see in autism. OFFIT: you can’t claim that vaccines are in any way a contributor, a real contributor to autism, and then not find it in epidemiological studies. The reason that you don’t find it is it’s not there to be found. // The truth is vaccines don’t cause autism. MILNER: Then why do all these parents say we got a vaccine, then my child got autism right after? OFFIT: They are perfectly reasonable. I mean, I think, you know, from a parent’s standpoint they—their child was fine, they got a vaccine and then they weren’t fine any more. The question is: Did the vaccine cause it? I mean, just because one event follows another, it doesn’t mean that it’s causally associated with the other. And hence you do the kinds of studies that allow you to answer that question. HALEY: There is nothing but solid proof that Thimerosal is incredibly toxic at the very lowest level added to any cells in culture, injected into any animal, or in any setting where we’ve looked at that exposure. Even applying it to the skin of a baby caused them to–to get so toxic that they died. MILNER: but wouldn’t you be able to say, okay, let’s look at this. Is there a population in Chicago that went through this health care system that did not get autism and did not get vaccines? Can we determine that that would be true or false? OFFIT: I think what you would have to do, if you were going to look, for example, at an unvaccinated population in Chicago, a home schooled population in Chicago, and try and compare them then to the surrounding community where say vaccine rates are where they should be, is you would have to prospectively do that study, which is to say you would—because you would have to control for the fact that the healthcare seeking behavior is different. OFFIT: I mean, you could do that study but it would not be an ethical study. First of all, it’s not ethical not to give vaccines to children because children can die of vaccine-preventable diseases. And when you do that, who’s responsible for that? HALEY: You know, this is something that all the people in the immunology or vaccine program fight totally against, and that’s to look at the effect of, um, at the rate of autism in the non-vaccinated population, the non-Thimerosal-exposed population versus that of an exposed population. They will do anything to avoid doing that, make any excuse. What he’s saying is absurd. It’s easy to go through and get a large general population of people that have not been vaccinated and look at them and look at the autism rate in that group. Our government has that data. They can definitely obtain it. // But the vaccine manufacturers and the people who live–make money off of giving vaccines do not want this looked at because what it does and will show and has shown is that the people who do not get vaccinated or do not get exposed to Thimerosal do not have nearly the rate of autism as do those that do. HALEY: Dan Olmsted was a reporter for–for UPI who went to, uh, Lancaster, Pennsylvania // went to the clinics there and tried to find Amish that were autistic. // I know they don’t vaccinate nearly as much. They–they don’t have their babies–babies in hospitals like most people do. » So they do–definitely aren’t getting the–a vaccine on the day of birth. Most of them. // Let’s see what the Amish autism rate is. And he couldn’t find very many. And the ones he found had been vaccinated. So I would say that, um, uh, this is still a viable option. And I would tell you that since then I have read a study // where they looked at homeschooled children. An epidemiological study where they sent out a–a form asking them to look at if their children were vaccinated and if any of them had any medical problems such as autism, pneumonia, etcetera. And the take-home lesson from that study was that the unvaccinated children were much more healthy than the vaccinated children. And they had a much lower rate of autism and asthma, etcetera. And, uh, the, uh, they were–and that the vaccinated children were much more likely to get sick later on in life with pneumonia. They had more, uh, hospital calls, etcetera. MILNER: Have we really taken thimerosal out of vaccines entirely? OFFIT: Yeah. // There are multi-dose preparations of influenza vaccine which are given to greater than two years old, which may contain thimerosol at preservative levels. And I think there’s a preparation of diphtheria/tetanus containing vaccine which contains thimerosol at preservative levels, but that’s it. // now that we essentially have removed ethyl mercury from vaccines, certainly to any vaccine that’s given to a less than two-year-old, they don’t receive preservative levels of mercury, the incidence of autism, if anything, has only increased. HALEY: Well, you know, they say it’s not there. That’s–first of all, that’s not true. Thimerosal is still used in the vaccine manufacturing process. They just don’t add it as a preservative anymore. But you still have a certain level–about one-tenth the level that used to be there is still there. And–and all the vaccines that are used in, um, multiple dose vials like the flu vaccine that they recommend for six months old children? Still contains, uh, Thimerosal. They’re getting a bolus dose of mercury. When you in–when you inject your baby, uh, with the flu vaccine at the–at the local clinics. // it’s the same as it was in 1985 when that–we started the man–CDC-mandated program. It’s quite a high level. It’s 12.5 micrograms per dose of mercury. That means it would be safe for a baby to take, uh, according to EPA standards, eating fish if the baby weighed 275 lbs. // it’s not against the law to give Thimerosal-containing vaccines. // And an HMO can go to the vaccine manufacturer or state health agency and say, « We want to buy vaccines and we want the cheapest because we don’t have a big budget. 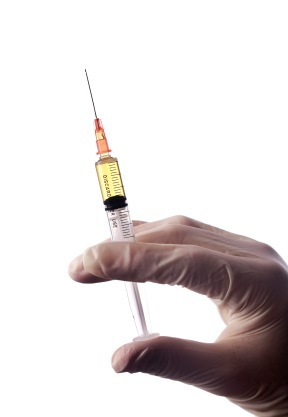 Is–can I buy this Thimerosal-containing vaccine for our children? For the children that are being vaccinated in our state, our location, our HMO? » And, yes, they can. It’s not against the law. And so you’re trusting whether these people will buy the vacs–the Thimerosal-free vaccines. And I know that they don’t do it all the time because I’ve had mothers call me up and say, « Doctor Haley, I have to vac–you know, my child vaccinated. What should I do? » I tell ’em, « Tell ’em you want to see the insert to show that the vaccine that they’re giving is Thimerosal-free and you look at a preservative and see if it says there’s Thimerosal. » And so many times they’ve called me back over the last few years, saying, « No, the vaccine they want to give my child contained Thimerosal. » So there is no proof that the Thimerosal has been removed from the exposure to American children. They like saying that so people calm down. People like me. MILNER: One thing that I don’t know whether it’s Boyd Haley or the guys in Calgary. No it was the guys Calgary. But I think Boyd Haley also did this. They took brain neurons, snail brain neurons and put a solution of different heavy metals on the neurons and they show at least on camera is the neuron being torn apart when they put a solution of mercury on there. As I understand it it’s elemental mercury, but you can correct me on it. And then they also say when they add aluminum to that mix, it catalyzes the reaction. Are you familiar with that? Have a response to that? Explain that in a different way? OFFIT: No, I think that historically in medicine that studies in laboratory cells or studies in experimental animals are not always predictive of events in children. MILNER: Let’s get back to the same point: The Burbacher study. What Burbacher appears to be saying is that ethylmercury is not eliminated from the body. It just clears the blood. It goes to the organs. Is that new information or is that disputed information? OFFIT: No. What Burbacher found is that it is possible for mercury, either as ethyl mercury or methyl mercury, to exist in the brain as essentially inorganic mercury, that the methyl or ethyl mercury molecule gets cleaved off. Is that toxic? Is that dangerous? There’s no evidence that that’s true. His study in experimental monkeys showed something that is interesting but has, to my knowledge, no correlate in harm. I mean, it’s certainly, it’s certainly known that organic mercury in the form of methyl mercury can be harmful or logarithmically higher quantities of ethyl mercury than logarithmically higher than one is getting vaccines is harmful, but the important thing is the proof is in the pudding. If it was harmful, then it should be shown in a study to be harmful. And the most sensitive way to answer that question is with an epidemiological study, not with an animal model study, not with a cell study of cells in the laboratory. If you want to know whether or not something is harmful in children, test it in children. And that’s been done redundantly. MILNER: So you’re saying elemental mercury in the brain is not a problem. MILNER: That you know of. OFFIT: I don’t know. I mean, it’s an interesting finding. OFFIT: So you can’t claim that vaccines are in any way a contributor, a real contributor to autism, and then not find it in epidemiological studies. The reason that you don’t find it is it’s not there to be found. HALEY: With regard to his epidemiological studies, those were mainly funded by the CDC. // none of them were done by Americans. They were done primarily in Denmark by a guy who’s now on, uh, the Most Wanted list by the Department of Justice for embezzling money from that same program. // they were loaded with, uh, statistical, uh, manipulations to reverse what would be considered, uh, a logical find. For example, in the study by Madsen, which is one of them he talks about, they said that removal of a toxic material, Thimerosal, which is a neuro-toxin, exposure–removing that exposure from infants caused the autism rate to increase twenty-fold. That’s in their- // or Figure 1 of their thing. That’s a ridiculous find. Totally ridiculous find. Instead of looking at that, and we have since looked at that in detail and found out that they, uh, they did a–a–a very, very selective and very poor data collection job // And we have now published a paper where we talk about six publications funded by the CDC or involved with, uh, CDC people, as well. Most of them done in, uh, Europe. That, uh, flagrantly ignore the rules of statistics to get the answers they want. It’s that old line of–from Mark Twain, « liars, damn liars, and statisticians ». They were paid to get the results showing that Thimerosal was safe and was not causing a toxic effect. And doing that, they broke all the rules of statistical analysis. And we have detailed that in a publication that’s currently out. “TO DATE, STUDIES CONDUCTED OR FUNDED BY THE CDC THAT PURPORTEDLY DISPUTE ANY CORRELATION BETWEEN AUTISM AND VACCINES INJURY HAVE BEEN OF POOR DESIGN, UNDER-FUNDED, AND FATALLY FLAWED. OFFIT: mercury certainly is a toxin. There’s no doubt about it. But as Paracelsus said, you know, in the 16th century, the dose makes the poison. I mean, that’s always true. HALEY: He talks about Paracelsus. And, you know, there is a–a bit of logic to that. Of course everybody knows if you drink one beer, you’re not gonna get as drunk as if you drink ten. So there is, uh, uh, a tie-in with that. But then when you compare it–when you look at Thimerosal, and you say, ‘what’s the volume–what–what level of // Thimerosal is toxic in a baby that starts causing toxic issues and how much–how close to that level do you get when you give a vaccine?’ You realize that the dose is quite toxic, that you’re injecting into these children. I mean, his–his mind was about this. Plus we also know that in the case of mercury, there have been studies done showing the synergistic effect with lead, cadmium, and certain other things like such as aluminum, and which we showed in the–the neuron study with aluminum. If you put in Thimerosal and then add either lead, cadmium, or aluminum, you dramatically increase the toxicity of that level of alum–of, uh, mercury. Mercury is synergistically enhanced by the presence of most other metals. // in the one study that’s been published, when they took a non-toxic level of mercury and a non-toxic level of lead, 1/20th of that, mixed the two together, they developed a ma–material or a solution that was 100% effective at killing rats. It killed 100% of the rats, when it should, if it were additive, the two together, it should have killed none of them. // in the one study that’s been published, when they took a non-toxic level of mercury and a non-toxic level of lead, 1/20th of that, mixed the two together, they developed a ma–material or a solution that was 100% effective at killing rats. It killed 100% of the rats, when it should, if it were additive, the two together, it should have killed none of them. THIS CHART FROM DR. DAVID AYOUB, SOUTHERN ILLINOIS SCHOOL OF MEDICINE COMPARES THE MERCURY AND ALUMINUM CONTENT IN VACCINES GIVEN TO CHILDREN BY EIGHTEEN MONTHS. FROM 1970 TO 1985 THESE CHILDREN RECEIVED FOUR SHOTS WITH BOTH MERCURY AND ALUMINUM. THAT WENT TO FIVE IN 1986, TEN IN 1994 AND ELEVEN IN 2000. THEN IN 2001, MERCURY WAS NOT LONGER ADDED AS A PRESERVATIVE, BUT WAS STILL PRESENT AT TEN PERCENT OF PREVIOUS LEVELS, WHILE SHOTS CONTAINING ALUMINUM WENT TO 15. BY 2004 THREE SHOTS WITH MERCURY AS A PRESERVATIVE WERE ADDED BACK IN WHILE ALUMINUM-CONTAINING SHOTS REMAINED THE SAME. BY 2007, CHILDREN UNDER 18 MONTHS RECEIVED THREE SHOTS CONTAINING MERCURY AND SEVENTEEN CONTAINING ALUMINUM. AS OF 2015, THERE ARE 10 SHOTS WITH MERCURY ADDED AS A PRESERVATIVE AND SIX SHOTS WITH ALUMINUM ADDED AS AN ADJUVANT. MILNER: Can our immune response hurt us? Can that be the problem with vaccines? What our immune system does as a result of seeing the foreign protein? OFFIT: Yeah. It’s certainly true that some infectious diseases can cause your body to react against itself. // Campylobacter, for example, is an intestinal bacterial infection that can itself cause something called Guillain Barre Syndrome, which is this semi-paralysis. And Lyme bacteria, you know, so called Borrelia Burgdorferi can cause you to respond, to react not only to the bacteria but also at the same time to these cells that sort of line your joints causing a chronic arthritis. But there’s no evidence that vaccines do that. HALEY: What has been shown in a lot of research is that mercury increases the susceptibility to, uh, immunological problems. And also infection from bacteria. For example, if you take brown Norway rats that are susceptible to, uh, getting arthritis from a certain bacterial injection, they will do it much quicker and much easier if they’re given a dose of mercury before you give them the–the bacteria. In other words, mercury enhances the ability of the bacteria to penetrate the joints and start the arthritic, uh, condition. And we have done studies and these are now published in some of the best toxicological journals in the world. // Looking at membranes that make up the cardiovascular system, as well as membranes that line the intestine, and what we have found is that mercury and methyl mercury and ethyl mercury and Thimerosal all cause those membranes to become very leaky. When those membranes become leaky, then the immune system loses its compartmentalization. Uh, in other words, the immune system is meant to be compartmentalized into your blood system. It’s not meant to get into your intestine. Nor are intestinal particles, um, meant to get into the bloodstream in–intact. And when you are exposed to certain levels of mercury, you can open up these membrane, make them leaky, as you would see in leaky gut syndrome or in colitis and certain things. When you start getting this leakiness, then your immune system can go wild–wild, attacking places where it shouldn’t be attacking. And producing antibodies that it normally would never ever produce. This is the reason why a lot of people have antibodies to certain food products in their bloodstream that should never ever have gotten into the bloodstream. And the only way you can make those antibodies is to get that entire food particle into the bloodstream. And you do that by having a leaky membrane, either in the arteries or in the, uh, uh, intestinal tract. OFFIT: But I think there’s been now excellent data looking at children sort of who, you know, who receive vaccines compared to those who didn’t. To answer the question: Are you at greater risk of asthma? Are you at greater risk of allergies? And I think the answer has been very clearly that you’re not. HALEY: there’s a study from Canada where they looked at the rate of, uh, asthma induced in children that got the vaccine at two months versus four months. And the asthma rate was much higher in those who got it at four months. He–he clearly selects the papers he wants to believe and ignores those that don’t fit into his–want–what he wants to believe, uh, uh, set. MILNER: The critics of the genetic thing would say, well, there’s no such thing as a genetic epidemic. Would you agree with that statement? OFFIT: I don’t think there’s an epidemic of Autism. // I think if we went into a time machine and went back thirty or forty years and used the same diagnostic criteria that we currently use to diagnose Autism, and introduce it into the community so that everybody is aware as they were—as they are now, and also make it very clear in that community now thirty years in the past that you will qualify for services if you have this diagnosis, I think you would find that the incidence of Autism would be the same thirty years ago as it is now. HALEY: I think his idea that autism is at the same rate as it was 30 years ago indicates to me that this man does not read the literature and the science at all. Doesn’t even–I mean, even from the Department of Education. They have put out, you know, scores of information saying, « We have a boy problem. Our boys are becoming less scholastically capable. And they’re not going to college. They’re not–they’re not even graduating from high school at the rate that they used to. » And the amount of money that we have been spending on children with neurological illnesses, attention deficit hyperactive disorder, I mean, I can’t believe he says that. I mean, it tells me he does not read the literature and I–I certainly hope he is much more, uh, critical when he reads the literature about making a vaccine which he’s supposed to be an expert in than he is when he’s reading other things on autism. He should not, with his, uh, comments, be considered at all, any type of an expert about autism. There were no reported cases of Autism prior to its discovery in 1943 by Leo Kanner. It continued to be rare for decades, but gradually increased. Now, according to the CDC, it affects 1 in 68 children. It is over 4 times more common in boys (1 in 42) than girls (1 in 189). Autism Spectrum Disorders – 4.9 million (mainly children). Alzheimer’s Disease – 5.4 million. Allergies, Chronic Fatigue Syndrome, Diabetes, Fibromyalgia, Lupus, Lou Gehrig’s, Rheumatoid Arthritis, Multiple Sclerosis – 15-25 million. Cardiovascular Disease – 88.6 million. The unsettled question of vaccine safety must be explored further. The format used in the pilot film is intended to give scientists on all sides a platform to speak to a broad public. If you agree that the question is vital and this format will enable advocates to educate the public about the issue, please support Public Affairs Media, Inc. a nonprofit corporation, in producing a full-length film including more virtual debates and scientific data.